Graceful shot, yet very dramatic. Well done with 6th place. Congratulations on your 6th placing with this ompressive high score. The image did drive the lance of nostalgia. Congrats on your "Best of the Best" top ten finish! I can see this as a postcard or poster. Well Done! I loved this one, I gave it a 10, probably because I have something very similar. Not trying to say that you stole it...haha. Anyways I like your house better than mine. Great job! I really do mean it. Message edited by author 2004-10-08 12:49:23. I was sure this was in the top 3... Congrats on an amazing shot and a highly respectable 6th place finish among all of these masterpieces... Hope you make a print available! I thought for sure this would ribbon. You did pretty good. Excellent shot! Congrats on 6th place E! Looks like something out of a movie or something. Nice shot. THis is definely one of my favorites, like the textures, the great green, a light forrest green that is wonderfully placed all over the forground and the great wreck of a house with the overgrowth. It matches well with the semi overcast sky. Desat. ?...great work. Even though I see lighting that seems somewhat unatural I like the effect. I'm very curious as to wher this was taken and I expect this to be in the top 8. Another very dreamy looking photo, well done..
looks Heida-ified, but I doubt this is her work, unless she has moved abroad. Cool image. I love the atmosphere portrayed here. Either a stunning Heida original or a masterful imitation of her tremendous style. Superb color tones, the plants growing on the ruins provide a mystical feeling and that gray-blue burned sky adds such mood. A 10, easy! Beautifully pleasing colors and obviously a skilled post processor! I love the detail adn quality of the texture of teh building against the clouds. The area of darkness on the right does not add to the ominous feeling, and muddles the shot up. Nice though, looks like a travel poster for rural ireland or wales. i'm having a hard time with this image. it is beautiful, but it also has such an etheral feel to it that it makes me think i'm looking at a painting instead of a photograph. Half of me wants to say too dark in some areas, the the other half says no. Perhaps a little unbalanced with it being so much brighter in the center area. Wow. What an atmosphere! I wish there is a bit more stauration only. Wonderful picture. Never in my life will I get to see a place like this. I hope I do, but I probably won't. That being said, thank you for sharing this part of the world with me. It's beautifully captured and exposed and the mood is wonderfully conveyed. 7. Looks like a painting - and a well-done one at that. The colors are a bit "unreal" which adds to the effect. Sky is dynamite. Border a bit strong. Okay...I've got to know how these almost mystical colorization is done????? You did such a great job of composing and capturing such a beautiful image, but also of processing it to enhance the mood of the image. Really great job. Incredible! Great composition, perfect use of subdued color, and an engaging subject really make this shot work for me. Looks like Heida's work! A captivating image.. wish I could make this my desktop! The ruins are quite beautiful. The sky adds to the quality of the photo. What if you dodge the clouds on the side slightly. The draw your eye away form the ruins. Isn't it neat how a structure so dilapidated can look as beautiful as your study captured it. I like the shades of green and the variances of clouds and blue sky. Great job. This is such an amazing photograph. It truly looks like art. The colors are perfect. The sky adds just the right emotion to it, and it is beautifully clear from front to back, top to bottom. Easy 10. This is a neat picture. Looks like a painting. I like the soft colors and the slightly out of focus appearence. I could definitely see this hanging on the wall. Nice shot and post processing. The title tells all here, very nice well composed shot, the colors are very nice. I think this is a great shot, but could be improved by a slight increase in contrast, maybe saturation too. Was burning used on the grass or is that shade from the clouds? Either way, I like the effect. It looks to me that a lot of nice shots could be taken of this structure. Some abstracts might be interesting as well. Very nice lighting and exposure on the whole image. Nicely burned around the edges to add focus to the middle. Good soft focus giving it a kind of surreal feel. I wish the sky was a little more blue, but that's just me. Very well done. 10! 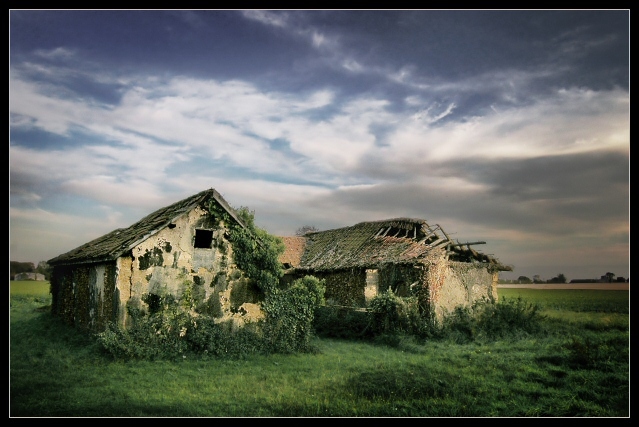 Who would think that such a decrepit structure could look beautiful... but you've done just that! Excellent job. Really like both the content and style of this photo. I'm assuming it's Neatimaged which, in the right circumstances, like these, can really add to the atmosphere. A very charming image but the treatment makes it hard to determine the overall strenght of the light. It appears that the delapidated houses are in a spot light and while such treatment is useful, I think the structures are strong enough to speak for themselves, hence I do not like the darkened edges on the front left and right. This is the type of image which lends itself to a pristine presentation rather than stylized. Message edited by author 2004-10-08 23:57:05.
fantastic lighting, interesting textures and a great sky. the building seem crowded to the left of the frame though. Just not sure about the crop. The space on the right seems to either want to be smaller or bigger. Not sure because I don't know what else is there. This Ruin rocks! I love all the over grown plant life. The soft color tones give it an awesome feel. Nice lighting effect, and well compsed. I'd like the structure to be a bit sharper, but it has a nice feel. A little too soft for my tastes - such old buildings should be full of textures. Very interesting subjects though. Beautiful atmosphere, great scene, I love it how the light (vignetting, burning, whatever) concentrates the view on the ruin itself. The sky adds more drama to it. I am not sure whether a more centered view would have improved it, but would have liked a bit warmer colors, especially on the ruin and the grass. Wonderful photo and great use of contrasting colors. not a lot to say here- a great photo - the softness of the buildings bugs me a bit. Beautiful but not real interesting. I think I would have liked a wider angle, maybe less centered. Very nice color. 8. I like the wizard of oz feel of this photo. The colors are such that it looks like it was a set built in a studio and then a matte painting behind. Very unique. Great photo. An 8. This is a sweet shot. I like the muted colors - nothing oversaturated. The sky is great too. I'm not as excited about the composition, but I'm not sure what I would have changed. There`s a sort of "haloing effect" in play here which highlights the ruins and subdues the rest of the image. I think that it does it`s job well. Wow, this almost feels like a painting. The textures in this image are fantastic. The building is really interesting, but the weather REALLY makes it perfect. I really am interested to see what kind of postprocessing you did. Did you dodge and burn? Vignetting? I just love the 'feel' of the image but can't quite nail down why. Just goes to show that it pays to go out in the so-called 'nasty' weather when most photogs stay home! I love the beautiful, dreamlike quality of this shot. It looks so soft, without being blurred. Lovely shot. Hard to give an helpful comment ... Superb photo ! I like the green tones full of life (maybe a litlle , little bit dark in case to have to find "something" ). Neat moody photo. I love the slightly desaturated color palette... or maybe that's an artifact of the lighting? Whatever it is, it's beautiful. Congratulations - my only 10. This has an old time post card feel to it. Just lovely! I'm guilty of overburning a lot of the time, and in my mind you've done almost exactly what i would do :). it makes for a neat effect - kind of surreal - but looks quite unnatural; The 'shadows' at the front don't seem to mesh with the shadows on the buildings or in the sky. Nice composition though, and fabulous colours. I can't quite understand the dark shadow cast on the right side ... if it is really a part of the composition to set the mood or should it be corrected (gradient layer or something)? But I like the subject, it is a very powreful portrait of many farms across America. I drove from the midwest to the east coast and back last summer and decaying farm houses and barns like this are common sights. As a foreigner, I can't quite understand it. Wow. I love the muted colours in this shot with the soft focus. It creates a dreamy "looking back" effect which matches perfectly with old ruins. Great work.. Love the soft focus and the colors. If all the sky would have been blue I presonally think it would look better but it still is GREAT like it is. You truly belong among the masters. A great shot, but I would have loved it more if there was a better focus on the buildings. It looks as if it isn't sharpen... 8. Wow... I love photos like that!!! I love it. I spent 2 minutes looking at it and the more I look the more I love it. This has Heida's burning touch written all over it. Wonderful! Such a feeling of despair. I like the softer focus and subdued colors. One of the challenges best. Super job! Wow, what an incredible location! This is a brilliant shot. Well done! Proudly hosted by Sargasso Networks. Current Server Time: 04/20/2019 06:36:12 PM EDT.